Ciaran Whelan thinks that Dublin's attack has stalled during the 2019 league and that Jim Gavin must 're-energise' his forwards ahead of the championship. 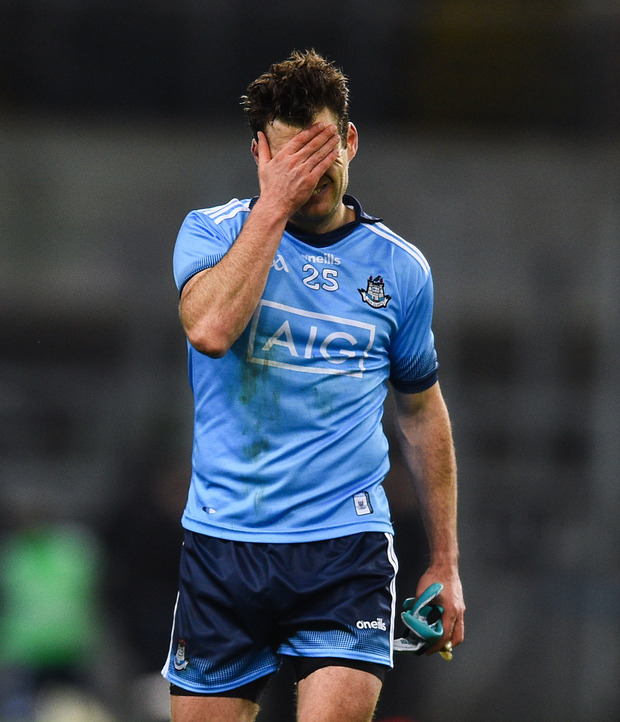 A defeat on Saturday night to Tyrone means that Dublin won't play in a league final for the first time since 2012, and have now lost three games in a single campaign for the first time under Gavin. Dublin have lost to Monaghan, Kerry and Tyrone and although they've also enjoyed comfortable wins over Mayo and Galway, overall the four in-a-row champions haven't hit their traditional spring stride. Speaking on The Throw-In, Independent.ie's GAA podcast in association with Allianz, Whelan said that he thinks the defeat to Tyrone was Dublin's 'worst performance' in a number of years. "I don't think they've taken a step back intentionally," Whelan said. "The culture that has been fostered over the last five or six years is to win every game. There have been a few games where they just haven't been good enough. The other night was probably their worst performance in quite a few years." While many observers, including Joe Brolly, think that Dublin have become more vulnerable defensively to teams that kick the ball quickly into the full forward line, Whelan is more worried about the attacking performances. "For me it's the other end of the field where Dublin have gone a little bit flat," Whelan added. "I think there have been periods in a few of the league games where their shot options have been very poor. They've hit a few bad wides, they've had a lot of turnovers in the last 20 minutes. To be fair to Tyrone, even after Niall Sludden was sent off, they were still able to get into that defensive shape. "And the reason they were able to get into that defensive shape is that Dublin take too many passes in the middle sector. They are a lot slower going forward. They have built this culture of a possession game and waiting for gaps and opportunities because they spent three or four years coming up against teams in a defensive shape. They play with great width but the movement in the inside forward line is not good enough. They are not hitting teams quick enough on the counter-attack. They got turned over numerous times as a result of that and were forced into some poor shots. "They've hit a flat spot in terms of their forward line and they need to re-energise. Time is on their side but they have a lot to work on."